Penn State offensive lineman Ryan Bates (52) against Kent State during the 2016 season. Check back here for position-by-position breakdowns of the Penn State depth chart leading up to the start of the 2018 season. 6-4, 301, R-Jr., Warrington, Pa.
Bates, an Archbishop Wood graduate whose 22 career starts ties him for the most on the Lions among offensive linemen, has shown versatility through his career having play left guard, left tackle and right tackle. He began training camp this summer at guard. Most of his 14 starts in 2016 came at left guard, and he was moved late in the season to left tackle. He stayed at left tackle for the first eight games of 2017 before suffering a leg injury against Ohio State. After missing the next three games, he shared time with Chasz Wright at right tackle for the final two contests. Bates received all-Big Ten third-team recognition last season. 6-7, 348, Gr., Woodbridge, Va.
Wright is the Nittany Lions' most experienced offensive lineman with 36 games played. He has 14 starts – five at left tackle in 2016 and nine at right tackle last season. He is the biggest at his position group in terms of size and the only offensive lineman who owns three letters. He has made steady progress since high school when he was a three-star recruit who did not receive a lot of interest from FBS teams. 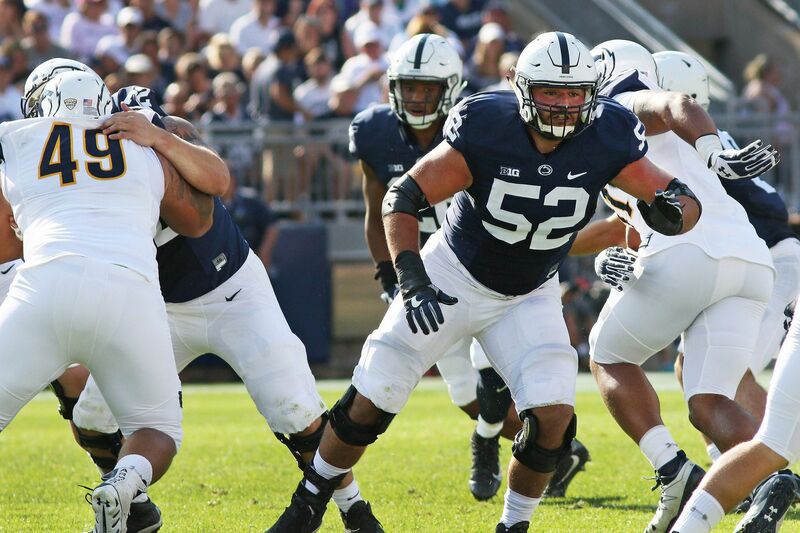 6-5, 326, Jr., Larksville, Pa.
McGovern, the only active Lions lineman who didn't take a redshirt freshman year, has switched positions again, going from guard as a freshman to center as a sophomore, and now back to guard. Offensive line coach Matt Limegrover said the team can get more out of McGovern at guard with his length instead of having him try to block shorter and stockier nose tackles. McGovern, who was named to the preseason watch list for the Rimington Trophy given to the nation's best center, carries a streak of 22 consecutive starts into the Sept. 1 season opener. 6-4, 306, R-So., Birdsboro, Pa.
Menet, a five-star recruit in high school and a three-time all-state player, is Penn State's newest center after seeing limited action last season at guard. Head coach James Franklin said he is impressed with Menet's athleticism, and Limegrover said Menet's play on the line is reminiscent of former Penn State star and current Eagles guard Stefan Wisniewski, who lined up at center for the Nittany Lions. Most of Menet's playing time in his 12 games last season came on special teams. 6-4, 336, R-Jr., Union City, N.J.
Gonzalez started all 13 games at guard last season, 12 on the left side of the offensive line, one on the right side, and played well enough to earn first-team All-Big Ten honors from Pro Football Focus. He is considered one of the strongest players on the team. 6-6, 312, R-So., Cranford, N.J.
Fries, who came close to playing in his initial season on the team because of injuries but kept his redshirt, started nine games — one at left guard, eight at right tackle — in his first year of action, He was named honorable mention All-Freshman by the Big Ten Network. He reportedly is battling Wright for the starting job at right tackle. Gellerstedt saw action on special teams in seven games last season, and in four of those games got some playing time on the offensive line. 6-3, 302, R-Jr., Holidaysburg, Pa.
Simpson played in every game on special teams in 2017. His most extended time on the offensive line was when he took over at center for most of the second quarter against Maryland. Miranda impressed Penn State coaches in the offseason with his performance in the weight room and during spring practice, and may have a shot at gaining some playing time.